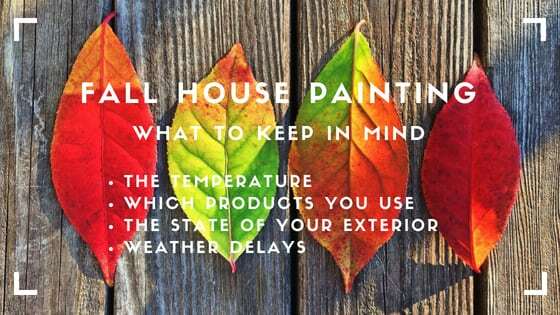 Should You Paint Your Home in the Fall? Is the fall too cold to paint your home? Should I just hold off until next year? What if there’s bad weather? As summer fades and we welcome fall the projects you haven’t quite gotten to maybe weighing on you. This panic of “I need to paint my house NOW” plagues August and early September but fear not! We here at Kind Home Solutions have your back. Many of our clients have felt the same way you do right now. Rushed, stressed, and overwhelmed. We’re going to set the record straight and help make sure your home is protected for the winter. Is it Too Cold to Paint in the Fall? There is a constant debate over which season offers the best weather for house painting. With people on all different sides of the argument here is the important thing for you to know. You can absolutely paint your home in the fall. The fall can be great for house painting as it is a bit cooler than the summer and you typically have pretty fair weather. What should you look out for is staining (especially decks) and temperature. Typically the latest you should be staining is through September so if you have a deck or home that needs to be stained you’ll definitely want to get the ball rolling. There can be a small grace period for deck staining the first couple weeks of October but be careful with those temps! So what’s the temperature range you’re aiming for? High end paints like Benjamin Moore’s Aura can be applied in as low as 40 degrees but you’ll want to be mindful of night time temperatures as the paint cures. If you’re looking at a low grade paint be sure to check the temperature specs as they usually can’t be applied on colder days. Should I Just Hold Off Until Next Year to Paint? Whether or not you should hold off on your project really depends on the current state of your home. If you simply have a little bit of faded paint then you’re home should probably be able to make it until the spring. If however, your home hasn’t been painted in the last five or more years and you are seeing a lot more wear and tear then you should absolutely look into painting before the snow flies. Here in Colorado we certainly don’t have the worst winters but they can still take a toll on your exterior. Things like rotten wood and failing, peeling paint can lead to much bigger problems (and costs) if left unattended. Take a look at all four sides of your home and if needed, have a professional come take a look. If your home doesn’t need immediate attention see or tips for protecting your home for winter below. When Should I Paint in the Fall? When it comes to painting in the fall you definitely want to get your paint project lined up sooner rather than later. Why? Well, if you get on a painter’s schedule for as soon as possible and bad weather rolls in you will have more flexibility. So, can you paint in late October or early November? You absolutely can but if you schedule later in the season you should be prepared to see weather delays with your project. This can be frustrating in the best cases and can push your job to the following year in the worst cases. We recommend playing it safe and trying to account for weather delays as much as possible. I Just Can’t Get it Done this Year So What Do I Do? Don’t panic. If it’s just not a project you can squeeze in for this fall there are still some steps you can take to protect your home. First, do an assessment of your home and note any key concerns. Any bare wood should be protected with primer prior to the winter. If you have rotten boards and can replace them, do so and prime them to seal it all in. If you have any old paint hanging around the garage or basement and can do some touch ups it may be worth it just to make sure nothing sees any further damage. The idea is just to prevent any further deterioration of the exterior surfaces. Something else that can help is to get a paint estimate. Why? Well, you’ll probably want to budget for your paint project so getting an idea of pricing can help prepare you for a next year expense. Some paint companies also offer discounts for getting on their spring production calendar. If you’re not sure, just ask! If you have any other questions be sure to check out our other blog posts and our FAQ page for more information. You can also call us directly at (720) 370-3063. This entry was posted in Exterior Painting and tagged exterior paint, exterior painting, fall painting.